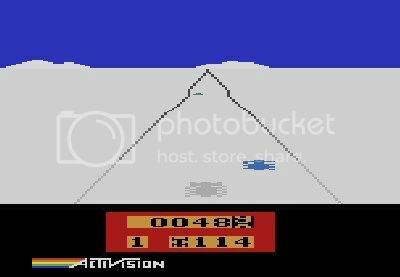 by PaulEMoz in "2600", "Activision", "Atari", "Enduro", "VCS", "racing"
God, I loved my Atari. I used to drive my mother mental, playing Circus Atari for ages at a time. The bouncing and bursting noises were enough to make sure she's never liked video games (although my dad got her a DS for Christmas and she can be found playing Brain Training or Puzzler World... truly unbelievable!). I also new people with an Atari. My cousin owned one, and so did a friend down the street. We used to swap games around... 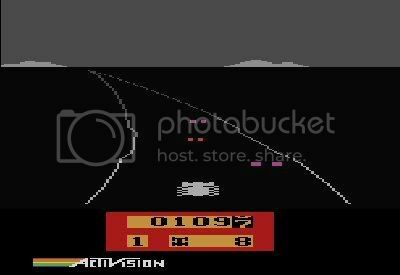 I had Activision's Grand Prix and Plaque Attack, my friend had Phoenix and Chopper Command, my cousin had Super Cobra and, umm, E.T.... but hey, I even enjoyed that back then. And as cartridges were far too expensive for ten-year-olds (at least, until I discovered Silica Shop), swapping was a good way to be sure of playing more games than we otherwise could. Yes, that's colour. It's snow! In this shot, I'm off to stock up on bread and milk. But now I have played it. And OK, it's the Atari VCS and I shouldn't have my hoped especially high, but I was a bit disappointed with it. It did feel a bit like Turbo, to be fair, which was a bit of a plus. Other than that, though, it lied up to its name, with me just holding down the fire button for as long as possible and dodging "cars" whenever possible. I say "cars"... it feels more like you're racing multi-coloured spiders. A strange effect. Overtaking them is more by luck than skill... it depends where you are on the track at certain points. This is only difficult at times because of the speed at which the game moves. This is another plus, I suppose... the game really does move at quite a lick, which is what you want from a racing game. And it does have a couple of good ideas... sometimes you'll be driving at night, and you can only see the rear lights of the cars in front. Or it might get foggy, at which point not only can you only see the rear lights, but visibility is lessened, which really tests your reflexes.